If you are a fan of the Terminator film series, then you know that the lead up to the theatrical break of Terminator Genisys this summer was met with finger’s crossed and high hopes. Would this entry be a franchise killer? WHEW … that was the big sigh of relief that director Alan Taylor delivered the goods with this re-boot of the series — much like Star Trek — with a new timeline for the narrative. The humor is great — especially with the running homage jokes related to Arnold Schwarzenegger’s character — and the “work-arounds” to connect the “remembered” past (what we know of the series) with the new timeline are well-constructed and very clever. The only gripe, and it is a small one, is that Emilia Clarke is not the same Sarah Connor that Linda Hamilton was. She’s a good four-inches shorter and doesn’t command the screen as Hamilton did, but you can understand Taylor working with her as they have that Game of Thrones connection — he directed and she was Daenerys Targaryen in six episodes together. Everything else works, with the age issue of Schwarzenegger cleverly handled (aging human flesh covering his metal internal skeleton) and the performances of Jai Courtney (Divergent, Insurgent, A Good Day to Die Hard, etc.) as Kyle Reese spot-on and Jason Clarke (Zero Dark Thirty, Dawn of the Planet of the Apes, White House Down) properly sinister as the anti-John Connor. 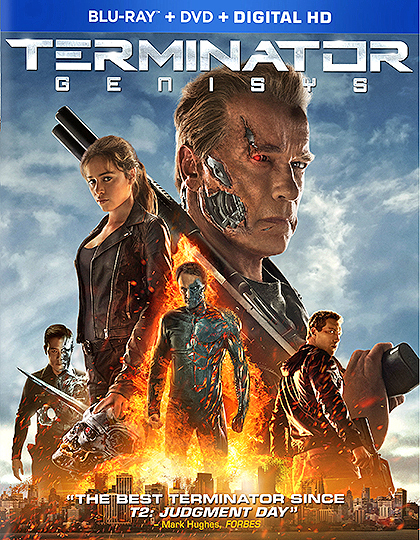 Paramount Home Media Distribution announced this past week that Terminator Genisys will be available as a stand-alone DVD and two Blu-ray/DVD Combo Pack (one with and one without a 3D viewing option) product offerings on Nov. 10. The ARR is 130 days and domestic ticket sales stand at $89.4 million. 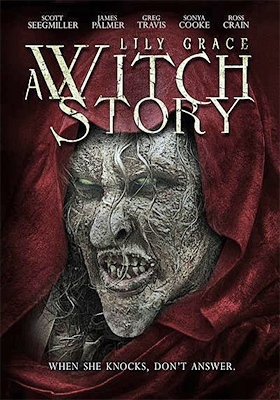 Midnight Releasing announced this past week that director Wes Miller’s bayou horror tale, Lily Grace: A Witch Story, will be making its way to DVD on Nov. 3. Ronald Baker (Scott Seegmiller — The Ceremony) gets the “bad” news that his father has died and that there is an estate to be settled. There are no tears shed as Ronald could care less about the fate of his father and his creepy old house in the Louisiana swamp. But duty calls and off he goes to his boyhood home. Once there he discovers that not all is as it seems. A series of foreboding letters, unsent, detail his father’s regrets about his failure as a father and some mysterious goings-on that have haunted him. It’s a lot to ponder, but before he can even settle in there comes a knock, knock, knocking on his bedroom door! It’s Lily Grace (the lovely Sonya Cooke under all of that ghoulish makeup), a swamp witch on a mission. That will certainly get your heart pounding! With the help of a local stranger, Jake Simons (James Palmer, who co-wrote the script), Ronald sets out to solve the mystery of Lily Grace and his father’s sudden death. He soon discovers that there are more than witches in this bayou that mean him harm! Warner Bros. Home Entertainment has tabbed Oct. 13 as the street for both DVD and Blu-ray/DVD Combo Pack editions of the directing and writing team of Travis Cluff and Chris Lofing’s “haunted house” thriller (it actually takes place in a high school auditorium), The Gallows. This indie pickup by the studio was released theatrically in early July and pulled in box office receipts of $22.6 million. That’s not bad for a film that sports a little-known cast and the all-too-common hand held camera narrative as its main chill generator. The ARR is 95 days. 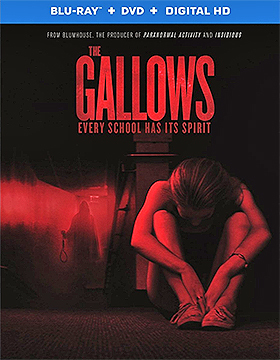 The film begins with a prologue that shows some video clips from a high school play, titled “The Gallows,” from 20 years ago at Beatrice High School that went horribly wrong. One of the actors, Charlie (Jesse Cross), is to be hanged on stage as part of the play, but instead of it being a “pretend” event, he is actually killed in front of a packed house. It’s now 20 years later and the school has decided to present an anniversary edition of the play as a tribute to poor Charlie. And here is where the fun begins as four students — Reese (Reese Mishler), Pfeifer (Pfeifer Brown, Ryan (Ryan Shoos) and Cassidy (Cassidy Gifford) — break into the auditorium to wreck the set, but soon find themselves trapped and unable to get out. Of course it is not as it seems and before the night ends three of the kids will be dead!!! As to bonus goodies, both SKUs include a gag reel, deleted scenes and the featurette titled “Charlie: Every School has its Spirit.” Exclusive to the Blu-ray/DVD Combo Pack are two additional featurettes. Also added to the DVD release calendar this past week by Warner Bros. Home Entertainment are two four-film collections showcasing the star power of Jeanette MacDonald and Nelson Eddy. These will be available on Sept. 15. 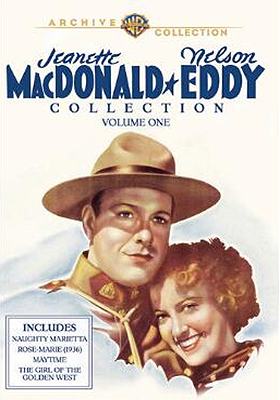 Jeanette MacDonald & Nelson Eddy Collection, Volume 1 contains Naughty Marietta, Rose-Marie, Maytime and The Girl of the Golden West, while Jeanette MacDonald & Nelson Eddy Collection, Volume 2 features Sweethearts, New Moon, Bitter Sweet and I Married an Angel. 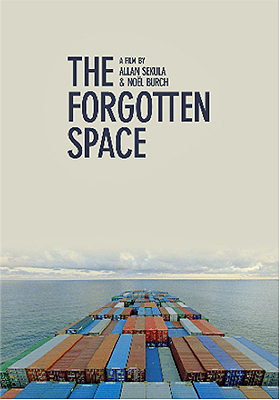 Icarus Films has picked Oct. 20 for the DVD debut of documentary filmmakers Allan Sekula and Noël Burch's insightful look at the container shipping industry, The Forgotten Space. The innocuous shipping container that you see piled high on cargo ships, zipping along by hundreds on snake-like freight trains and one right after another attached to truck cabs on the highway. Interchangeable building blocks … in fact, people have even converted them into housing. Technically they are intermodal containers and the latest stats show that there are over 20 million in use worldwide (likely more, since the data is a couple of years old). 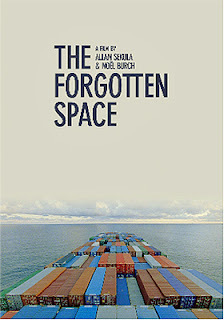 Instead of droning on about the history and uses of these symbols of commerce, filmmakers Sekula and Burch concentrate the bulk of their essay on the ways in which container shipping has impacted the lives of diverse — but connected — people around the world. The Forgotten Space is presented as a lesson in economic Darwinism and comes close to being preachy, but points of profound change brought about by this simple concept are not without merit. 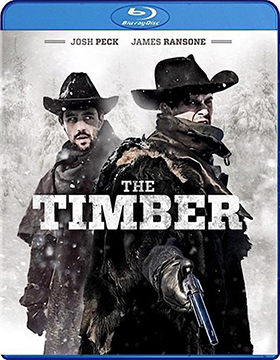 If you want to be cold, really cold, then a viewing of Well Go USA’s forthcoming DVD and Blu-ray release of writer/director Anthony O’Brien’s The Timber will certainly get you chilled to the bone. Slated for release on Oct. 6, we find ourselves riding with brothers Wyatt (James Ransone — Cymbeline, Sinister, Tangerine, etc.) and Samuel Seagrave (Josh Peck — Danny Collins, Red Dawn) on something of a fool’s errand. It’s the Yukon Territory in 1898 and their property — which they’ve fought tooth and nail for since their father abandoned them — is being foreclosed on by the bank and the only way out of the jam is to bring in a desperate killer named Jebediah (William Gaunt) … who is none other than dear old dad. Samuel’s wife, Lisa (Elisa Lasowski), is quick to point out that their chances of survival out there in the dead of winter, not only against the elements, but their crazed father (and men just like him) are not all that good. And sure enough, no sooner are they gone when Lisa, their young son and the matriarch of the family, Maggie (played by Maria Doyle Kennedy), find themselves being stalked by the banker and his minions. It’s all a ruse as he knows that they are as good as dead and their holdings will soon be his. Wyatt and Samuel head out to “The Timber” — a truly godforsaken place — with a fellow by the name of Colonel Rupert Thomas (Mark Caven) riding with them. He is familiar with the territory, but is soon dead. Horses gone, the brothers are afoot and find themselves quickly locked in a battle for survival. Bitter cold, ruthless killers, cannibals (yes, human flesh-eaters) and a father who would just as soon murder his own sons faster than spit freezing on its way to the ground are just some of the challenges that they will face … yes, getting home is not likely!!! Bonus goodies include commentary with filmmaker Anthony O’Brien, a pair of featurettes — “Gunfight” and “Nightmare” — and video sessions with cast members: Josh Peck, Elisa Lasowski and Julian Glover (he plays the banker). It was probably so obvious that few took notice, but Oscar-winner Bill Condon’s Mr. Holmes is a clever entry in the Sherlock Holmes film series. 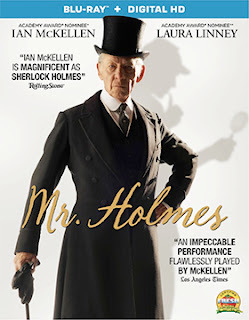 Not as flashy as the Robert Downey films or as rat-a-tat-tat in the deliver as the Basil Rathbone/Nigel Bruce programmers, but a nice stroll just the same for a retired Holmes (played Ian McKellen) who is struggling to solve his final case. Lionsgate Home Entertainment will deliver DVD and Blu-ray editions to detective fans on Nov. 10. Ticket sales were $15.4 and the ARR is 116 days.